On Saturday, April 22nd, the Law 12 class anxiously awaited the reveal of which side they would first represent – society or a taxi driver? 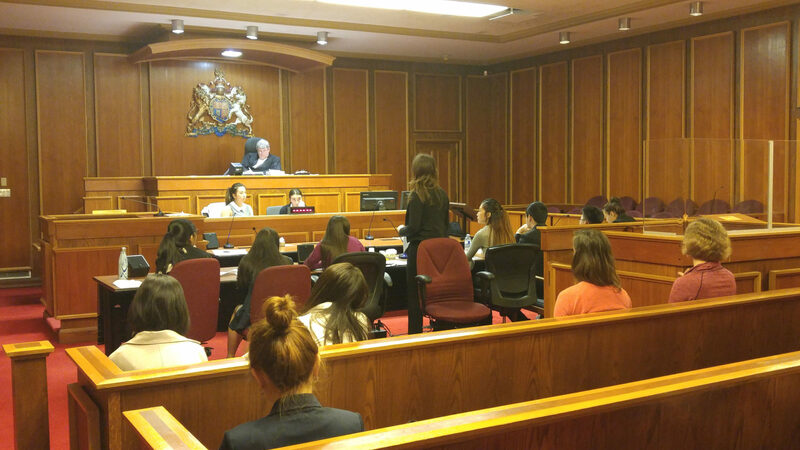 This year’s Provincial Mock Trial Competition, held at the Victoria Courthouse, was a case of dangerous operation of a motor vehicle and assault with a weapon (in this case the taxi). 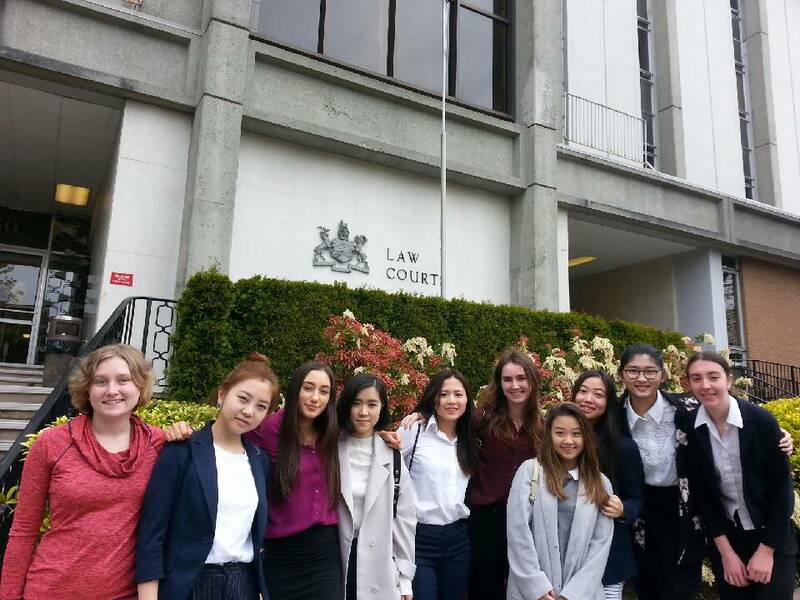 Thirteen teams from the island and lower mainland came to show their best legal skills in hopes of being crowned the top legal team. The team had been preparing for this competition since the end of February, when they received the case materials and had to build convincing cases to represent both sides. The team represented the Crown in round one and Defence in round two. In both rounds they delivered their opening and closing statements eloquently, held witnesses accountable for what they did or did not see, presented evidence diligently, and took informed risks by objecting the opposing counsel during direct and cross examination. Our witnesses were instrumental in helping to prove guilt beyond a reasonable doubt for the Crown and raise possibility of doubt for the Defence. The girls worked incredibly hard under a tight time frame and, after two rounds, were elated when it was announced that they had made it to the semi-finals, along with three other teams – a first for an SMS team in this competition! 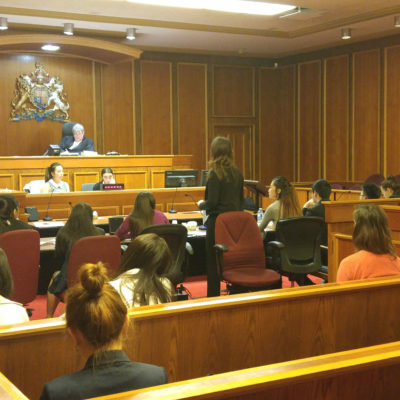 Congratulations to Alice Brown, Marina Bienenstock, Selina Liu, Vicky Qian, and Lucia Ren for demonstrating excellent critical thinking skills on the spot as our Crown and Defence team, as well as Yvette Lam, Lily Woodard, and Kinlis Ye for their excellent performances as witnesses. Kaitlyn Mingo and Peggy Sun joined us after their choir performance, and were able to step in to help the judge as Court Clerks in our semi-final round. Special mention goes to Lucia Ren, who was selected by the judges as the recipient of the top award for our team. As team coach, I had the pleasure of sitting on the edge of my seat during the nail-biting rounds. I truly wish that everyone had the chance to see these fantastic young women in action on Saturday as it was such an exceptional representation of everything we aim to instill in our girls here at SMS. 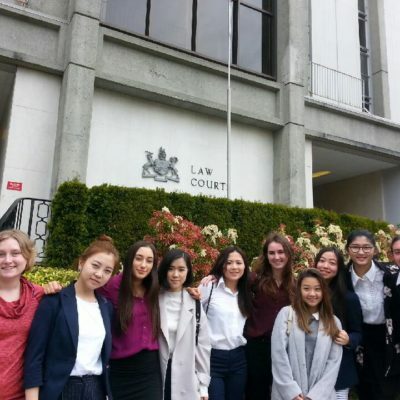 My final verdict is that these young women are guilty beyond a reasonable doubt of working as a team with absolute integrity, supporting one another wholeheartedly, having the courage to risk failure, and being upstanding ambassadors for St. Margaret’s School. We look forward to continuing our quest for the coveted gavel next year. Thank you so much to everyone who was involved, either directly or indirectly, in making this an incredible experiential opportunity for our girls.